Jenne Leedes is an amazing woman, and with her family has created 2 fantastic businesses in Greenmeadows, Napier operating out of the same location – Greenmeadows on Gloucester (studio & private apartment accommodation in Taradale) and Bike About Tours (full-service bike tours and Napier bike hire). She told me that her accountant thought it was a terrible idea at the time, but apologised to her years later for not possessing the of vision that Jenne has. Greenmeadows On Gloucester is extremely well-maintained with caring attention to every detail. With warm, light, comfortable and private studio & apartment accommodation, and a great deck for socialising, not to mention everything you need just a short walk away, you can’t go wrong. And by the way – the price is extremely reasonable! Jenne is a true people person and goes out of her way to ensure her guests have the best time possible. Jenne built the 2 websites for the businesses herself and did an incredible job. The sites were fine and guests weren’t complaining of problems, but they weren’t mobile responsive, and with nearly half of tourism traffic coming from cellphones and tablets it was time to make a switch. 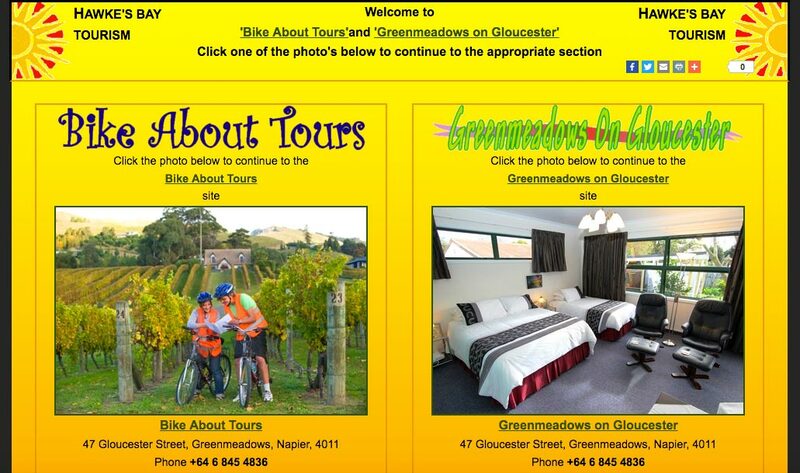 The first thing I noticed with the Greenmeadows On Gloucester site was that entry to both sites was through the homepage. Jenne had a portal to both her sites as the same homepage for both sites, so that people would see she did related businesses. 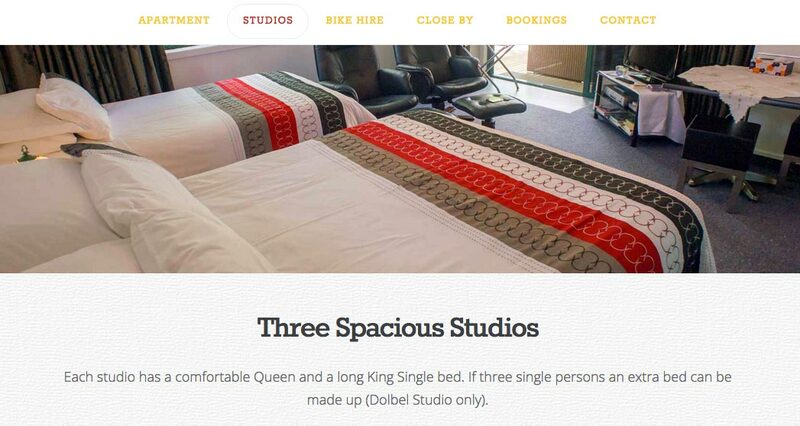 While we decided it’s great that she can advertise both, it would be better for her guests if they could go straight to what they were looking for and make it clear at the right place and time that there were accompanying options should people want them. We also simplified the site, putting all the details on the specific pages and adding price and booking straight from the page to make it easy for guests to flow through the process. Jenne now has analytics on her site and will be seeing a lot of traffic from mobile devices – this is a necessity in her industry. Analytics also are showing her where her traffic is coming from, what sites are sending her the most, who to say thanks to, who to work more with. She can also see where people are searching from, which sites she is advertising on are working, and when she is seeing peaks in traffic. This will help her make advertising decisions with regards to flyers, online advertising and so on. Jenne is a fantastic woman to work with and I know her business will always be booming.